For the province, see Bamyan Province. Bamyan[pronunciation?] (Persian/Pashto: بامیان; also spelled Bamiyan or Bamian) is the capital of Bamyan Province in central Afghanistan. With an altitude of about 2,550 m and a population of about 100,000, Bamyan is the largest town in the central Afghanistan region of Hazarajat, and lies approximately 240 kilometres north-west of Kabul, the national capital. Many statues of Buddha are carved into the sides of cliffs facing Bamyan city. In 2008, Bamyan was found to be the home of the world's oldest oil paintings. The city of Bamyan has a population of 100,000 (in 2014). It has four districts and a total land area of 3,539 hectares. The total number of dwellings in this city are 4,435. The Bamiyan valley marked the most westerly point of Buddhist expansion and was a crucial hub of trade for much of the second millennium CE. It was a place where East met West and its archaeology reveals a blend of Greek, Turkic, Persian, Chinese and Indian influence. The valley is one of Afghanistan's most touristic places. Bamyan City joined the UNESCO Creative Cities Network as a Crafts and Folk Art city in 2017. Historical reconstruction work in the valley. Situated on the ancient Silk Route, the town was at the crossroads between the East and West when all trade between China and the Middle East passed through it. The Hunas made it their capital in the 5th century. Because of the cliff of the Buddhas, the ruins of the Monk's caves, Shahr-e Gholghola ('City of Sighs', the ruins of an ancient city destroyed by Genghis Khan during the 1221 siege of Bamiyan), and its local scenery, it is one of the most visited places in Afghanistan. The Shahr-e Zuhak mound ten miles south of the valley is the site of a citadel that guarded the city, and the ruins of an acropolis could be found there as recently as the 1990s. The town is the cultural center of the Hazara ethnic group of Afghanistan. Most of the population lives in downtown Bamyan. The valley is cradled between the parallel mountain ranges of the Hindu Kush and the Koh-i-Baba. Bamyan is a small town with a bazaar at its center. It has no infrastructure of electricity, gas, or water supplies. According to Sister Cities International, Bamyan has established a sister city relationship with Gering, Nebraska, United States. It has an airport with a gravel runway. The main crops are wheat, barley, mushung, and baquli, grown in spring. When crops are damaged by unusually harsh weather, residents herd their livestock down to Ghazni and Maidan provinces to exchange for food. The city and the province are served by Bamyan Airport. A new airport has been completed in 2015 with an asphalt runway. The project was funded by the Japanese Government and carried out by the United Nations Office for Project Services (UNOPS). Bamyan's climate is transitional between cold arid (Köppen BWk) and semi-arid (Köppen BSk), with cold winters and warm, dry summers. Precipitation mostly falls in late winter and spring. Statue of a bearded man with cap, probably Scythian, Bamyan c. 3–4th century. Head, from Bamyan c. 6–7 century. The city of Bamyan was part of the Buddhist Kushan Empire in the early centuries of the Christian era. After the Kushan Empire fell to the Sassanids, Bamyan became part of the Kushansha, vassals to the Sassanids. The Hephthalites conquered Bamyan in the 5th century. After their Khanate was destroyed by the Sassanids and Turks in 565, Bamyan became the capital of the small Kushano-Hephthalite kingdom until 870, when it was conquered by the Saffarids. The area was conquered by the Ghaznavids in the 11th century. In 1221 the city and its population were completely wiped out by Genghis Khan. The Qarlughids established their capital in the city soon thereafter. The first European to see Bamyan was William Moorcroft (explorer) about 1824. 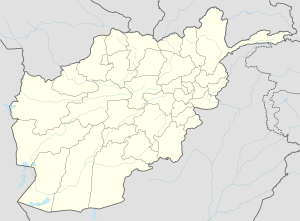 During 1998–2001, Bamyan has been the center of combat between Taliban forces and the anti-Taliban alliance; mainly Hizb-i-Wahdat – amid clashes among the warlords of local militia. Bamyan is also known as the capital of Daizangi. On the cliff face of a mountain nearby, three colossal statues were carved 4,000 feet apart. One of them was 175 feet (53 m) high standing statue of Buddha, the world's tallest. The ancient statue was carved during the Kushan period in the fifth century. The statues were destroyed by the Taliban in March 2001, on the grounds that they were an affront to Islam, even though they were left intact by Muslim rulers for 1200 years. Limited efforts have been made to rebuild them, with negligible success. At one time, two thousand monks meditated in caves among the sandstone cliffs. The caves were also a big tourist attraction before the long series of wars in Afghanistan. The world's earliest oil paintings have been discovered in caves behind the destroyed statues. Scientists from the European Synchrotron Radiation Facility have confirmed that the oil paintings, probably of either walnut or poppy seed oil, are present in 12 of the 50 caves dating from the 5th to 9th century. The murals typically have a white base layer of a lead compound, followed by an upper layer of natural or artificial pigments mixed with either resins or walnut or poppy seed drying oils. Possibly, the paintings may be the work of artists who travelled on the Silk Road. The caves at the base of these statues were used by Taliban for storing weapons. After the Taliban were driven from the region, civilians made their homes in the caves. Recently, Afghan refugees escaped the persecution of the Taliban regime by hiding in caves in the Bamiyan valley. These refugees discovered a fantastic[clarification needed] collection of Buddhist statues as well as jars holding more than ten thousand fragments of ancient Buddhist manuscripts, a large part of which is now in the Schøyen Collection. This has created a sensation among scholars, and the find has been compared with the discovery of the Dead Sea Scrolls. 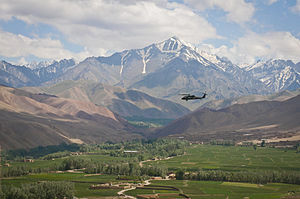 From 2003–13, a Provincial Reconstruction Team was based in Bamyan, first manned by U.S. forces, and, since April 2003, by New Zealand Defence Force personnel which made up the Provincial Reconstruction Team. The 34th Division in the area, part of the 4th Corps, was affiliated with Karim Khalili. Bamiyan was one of the first pilot centres for the Afghan New Beginnings Programme of Disarmament, demobilization and reintegration. On 4 July 2004 disarmament began in Bamiyan, and on 15 July 2004 disarmament was continuing in Bamiyan including soldiers from the 34th and 35th Divisions of the then Afghan Army, often referred to as the Afghan Military or Militia Forces. Bamyan, located	in the central highlands, is one of the oldest cities in the country and is widely known for the giant, ancient Buddha statues that were carved into the side of a cliff. The city of Bamyan is dominated by agriculture at 54% with only 18% of total land classified as built-up. Wikimedia Commons has media related to Bamiyan Valley. Wikivoyage has a travel guide for Bamiyan. Wikisource has the text of the 1911 Encyclopædia Britannica article Bamian. ^ "About this Collection". The Library of Congress. Retrieved 26 April 2016. ^ "Oldest Oil Paintings Found in Caves". Retrieved 26 April 2016. ^ "The Historic City of Bamiyan has joined the UNESCO Global Network of Learning Cities (GNLC) - Afghanistan National Commission for UNESCO". unesconatcom.af. Retrieved 2018-10-03. ^ "Climatological Normals of Bamiyan". Hong Kong SAR Government. Retrieved 2011-01-05. ^ "Bamiyan Climate Normals 1961–1990". National Oceanic and Atmospheric Administration. Retrieved December 26, 2012. ^ Michael Vinay Bhatia, Mark Sedra, Afghanistan, Arms and Conflict: Post-9/11 Security and Insurgency, Routledge, 2008, ISBN 113405422X, 283. ^ "Press Briefing by Manoel de Almeida e Silva, Spokesman for the Special Representative of the Secretary-General on Afghanistan". UN News Centre. 4 July 2004. Retrieved 26 April 2016. ^ "Press Briefing by David Singh Senior Media Relations Officer and by UN agencies in Afghanistan". UN News Centre. 15 July 2004. Retrieved 26 April 2016. ^ "The State of Afghan Cities report 2015". Archived from the original on 2015-10-31. ^ "Bamyan Province" (pdf). Retrieved 8 July 2013. ^ "International partnerships and sister cities". poriruacity.govt.nz. Retrieved 2018-05-15. Dupree, Nancy Hatch (1977) [1st Edition: 1970]. An Historical Guide to Afghanistan (2nd Edition, Revised and Enlarged ed.). Afghan Tourist Organization.